One of the most popular events for Dtoiders to go to are those annual Final Fantasy concerts, or listen into the ever popular Video Games Live, or even just watch arrangements of videogame tunes on Youtube. Something about the fresh arrangements of these songs we know and love bring waves of nostalgia and make for a good night out. So I have to ask: are you going to be in the San Francisco Bay Area on October 16? If you are, you might want to pay attention for the event happening at UC Berkeley (my alumni!) in Zellerbach Hall at 8 pm. Called Hideo, this is a a full tribute night to games, with songs ranging from a Mega Man medley, selections from many Final Fantasy games, and arrangements from ICO, Legend of Dragoon, Chrono Cross. There are even some anime themes making an appearance, with Full Metal Alchemist and Cowboy Bebop leading the charge. All of these songs will be coming together to make a cohesive plot, and should make for an interesting reinterpretation of all of these tunes. What's even better is the love the musicians have for the source material, and while not everyone is a gamer, everyone that I've talked to with this event clearly loves and respects the power of the music. Considering many of them are developers themselves, there is a lot of respect going around. So what do you think? 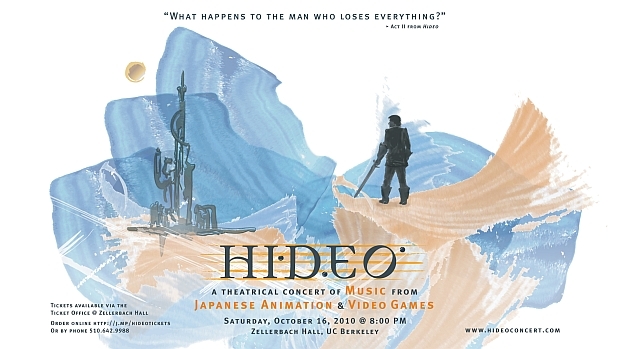 For anyone in the Bay Area, does Hideo sound right for you?